Following World War II, modernism in Europe promised to raise the living conditions of the masses in a quick, affordable and democratic way. Socialist housing projects were built to enact this modernist ideology, easily identifiable today by their industrialized production methods and their unique, brutalist forms. 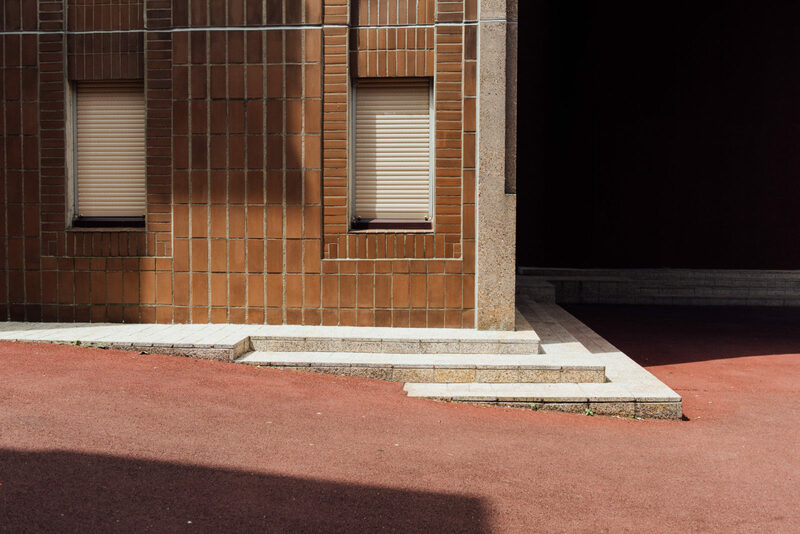 On a roadtrip through the suburban surrounds of Paris, we visited Les Tours Aillaud Cité Pablo Picasso, Arcades du Lac de la Sourderie and Les Damiers Courbevoie—housing estates from the ’70s and ’80s that were designed with architectural ambitions of social emancipation. Emerging in the late ’40s, brutalism gave form to the functionalist aspirations of early modernism, whilst being symptomatic of a wider change in artistic expression. From the outsider movement of Jean Dubuffet’s l’art brut, and Le Corbusier’s architectural béton-brut, the brutalist aesthetic proffered concrete buildings that were monumental in size and sculptural in their geometric forms. This new style of modernism argued that a classless society could be built on the foundation of rationally designed housing. Housing that addressed broader social issues, providing space for not only living: but for studying, recreation and community interaction. But the utopian society these estates attempted to create remained unattainable and idealistic. The modernist style would come to be blamed for the social problems of those it housed—the projects condemned as centers of decay and crime, lambasted by critics, and then demolished. 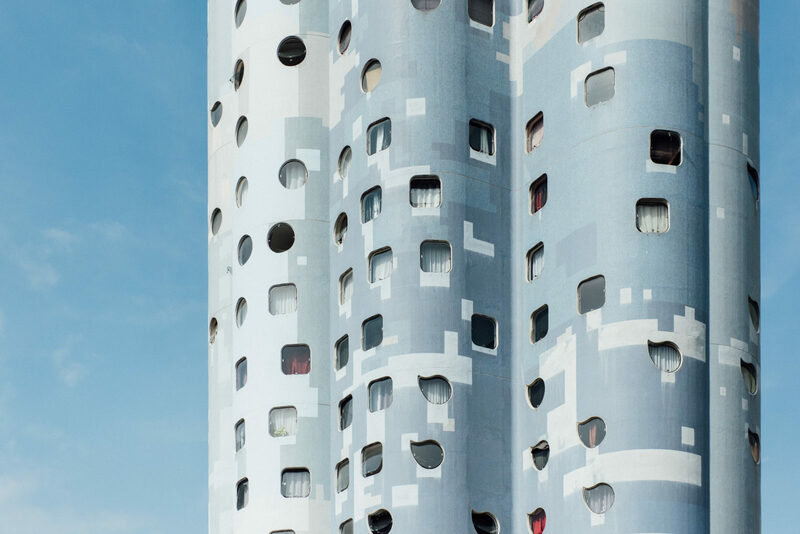 Les Tours Aillaud Cité Pablo Picasso in Nanterre, an inner suburb of Paris, is one of few estates that remain. Built in 1977, the housing project consists of 18 towers and over 1,600 apartments. Despite their differences in height, the towers share a unifying cylindrical shape with frescos in pate de verre: tiled patterns in blues and greens that tessellate across them in arcs and clouds. 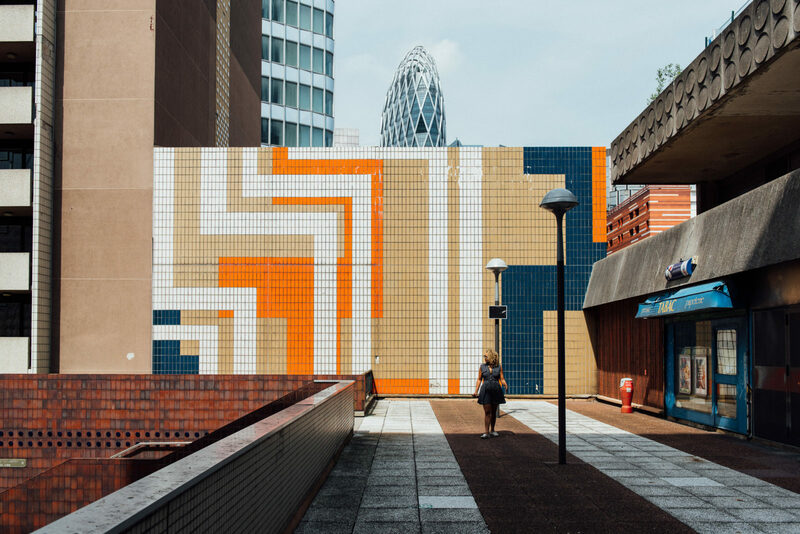 Designed by French architect Émile Aillaud, the project adopted individualized urban planning strategies that are visible in the smoothness of its abstract forms and in its modernist handling of public spaces. For each apartment, there is a tree—1,600 in total, set amongst a rolling landscape of cobblestone mounds that link the buildings to one another. The estate feels at once familiar and foreign, empty and inhabited. The circular windows are used as makeshift-dryers for the laundry of those who live there, and stairwells lead to doorways that don’t exist: small signs of those there, and those gone. The whimsical exterior is today missing tiles—its sculptural curves seem to have worn softly over time. Not far from Les Tours Aillaud is Courbevoie: one of the most densely populated areas of Europe. 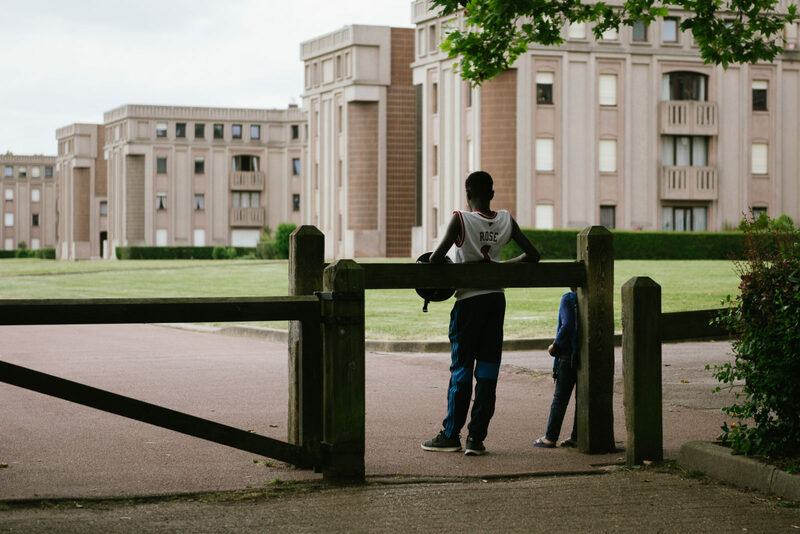 Amongst the tallest buildings in Paris lies Les Damiers—a brutalist estate defined by the coarse edges of its concrete structures and, today, by its emptiness. Many of the apartments have not seen maintenance or tenants in years, their retro-abstract exteriors dulled with grime. There is a rhythm to the space, an evocation of childhood in the way the buildings stack together like blocks. Circular motifs pattern across walls, their forms reflected in the abstract sculptures that adorn the empty walkways. The handful of residents that remain in Les Damiers are fighting a losing battle against councils and international investors who wish to see their homes demolished, replaced with luxury housing blocks that promise a different kind of utopia. 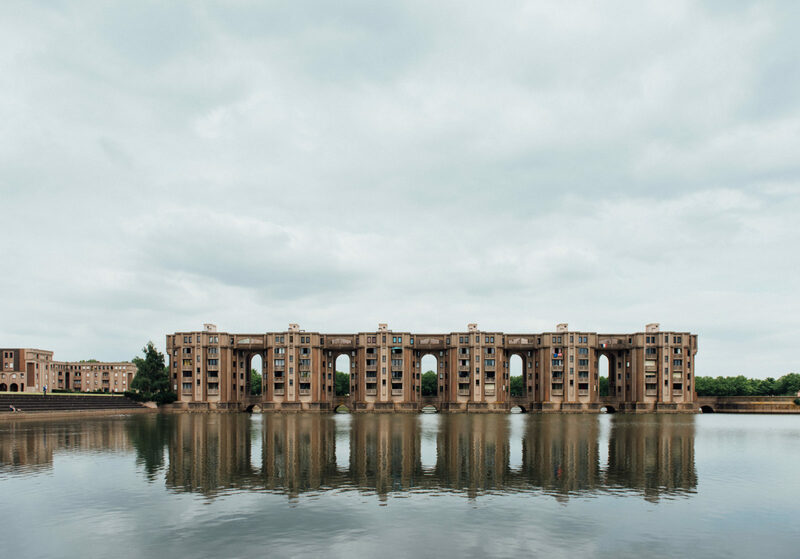 Similar in its monumentality and conception of community space is Arcades du Lac de la Sourderie—part of a large complex designed by Catalan architect Ricardo Bofill in 1976. Drawing on Pont d’Avignon, Château de Chenonceau and the Aqueduct of Segovia, the building reaches across the waters of an artificial lake. Its ochre foundations, pale pink stone work and windows are mirrored by the still, opaque blue of the water below. The neighborhood Sourderie feels somewhat like an Escher painting—a never-ending sequence of alleys and interior gardens, perfect squares of lawn, geometric walls and classical pillars. We exist in an age of utopian aspiration—we have drawn it, designed it, built it—yet it remains an impossible idyll. 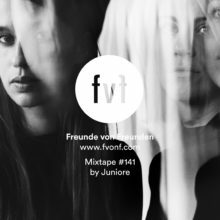 At FvF we have been looking at contemporary urban life and the creative personalities shaping it. What will our urban spaces look like ten years from now? How will they be designed? History shows that cities often fall short of their lofty ideals. For further discussions and interviews on this topic, see here: The Sooner Now.